Alright, who loves Chocolate and Pastries – I DO! I mean SERIOUSLY does it get any better??? The CORRECT answer (in case you were wondering) is NO, it doesn’t get any better. 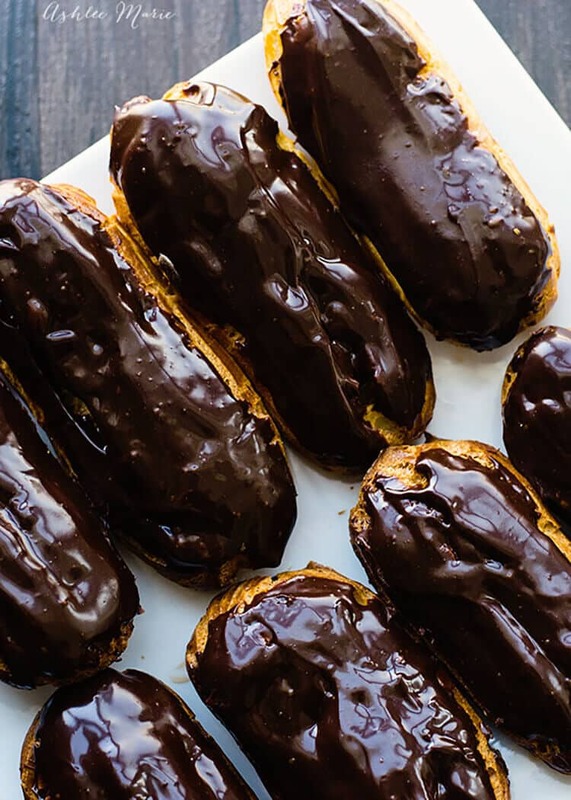 So today I have a treat for you – Chocolate pastry cream filled eclairs with a chocolate ganache glaze, I mean chocolate and chocolate held together with a pastry, DIVINE! AND of course a recipe that’s considered difficult (totally not, you’ll see) deserves a video! 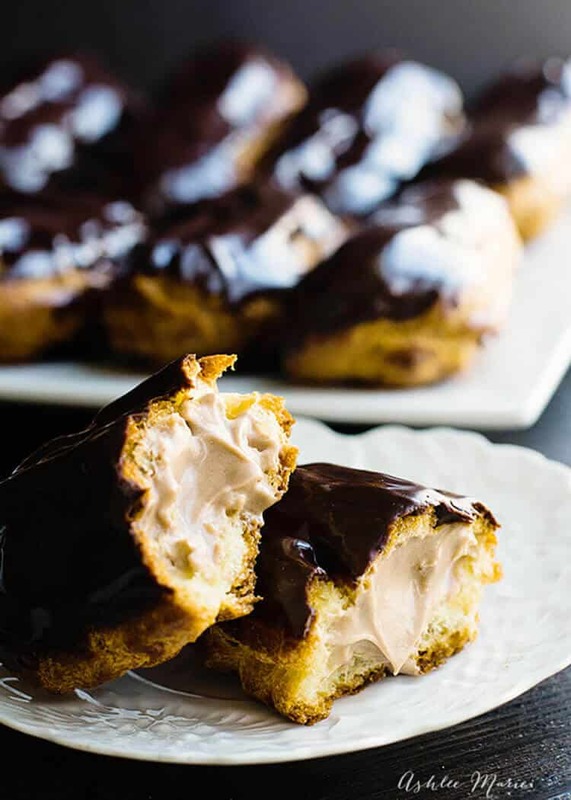 How to make a pate a choux dough for cream puffs and eclairs along with this chocolate pastry cream! I hope you love it as much as I do! My kids DEVOURED these, like seriously they were gone the moment I let them try them. Now if you don’t like the holes in the bottom (it does leave a mess on the plate) you can also poke holes at both ends instead and fill from there. BUT that can sometimes leave the center empty of filling. OR instead of poking holes in the bottom and filling from there you can poke holes in the TOP and fill from there covering the holes with the ganache. BUT it will leave the top not smooth, but with the ridges from the open star tip that wouldn’t matter with these. Use a large round tip to pipe two to three inch lines onto parchment-covered baking sheets. In the last 5 mins of baking pierce the bottom with a skewer or chopstick to allow steam to escape and dry out the inside (I do 2-3). Strain the pastry cream through a fine mesh strainer into a bowl (that’s in a bowl of ice to help cool it faster) and stir in ¼ cup of the butter and vanilla. 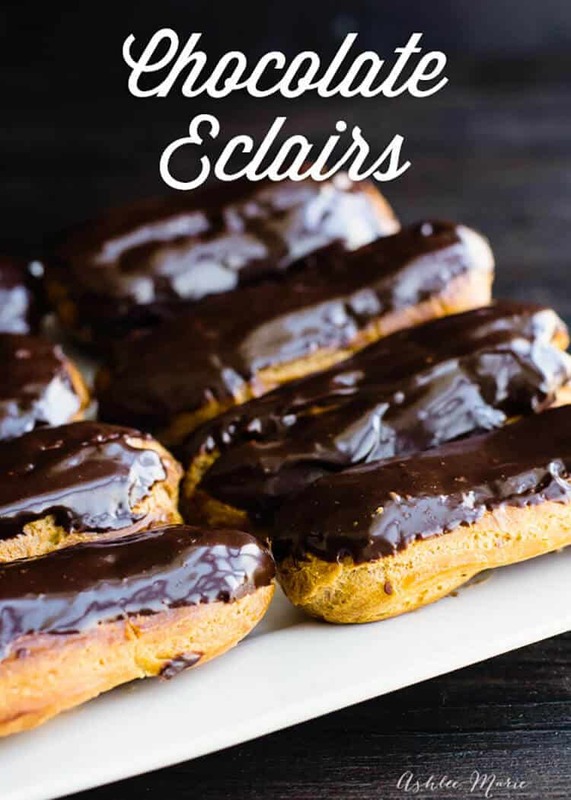 dip the eclairs into ganache glaze, let set and serve! Mmmmm ganache glaze. This is one part cream one part chocolate, so thinner than traditional ganache. Delicious but not too thick. You can use a spatula to “frost” the top for a smoother finish, but it’s easier to just dip, shake and flip. For the filling you can use the chocolate pastry cream straight, but it’s super rich and thick, I like combining it with stabilized whipped cream to lighten it up a bit, add as much or as little as you want to get the filling that is perfect for YOU! So we’re all done! PERFECTION! And much easier than you thought, am I right? 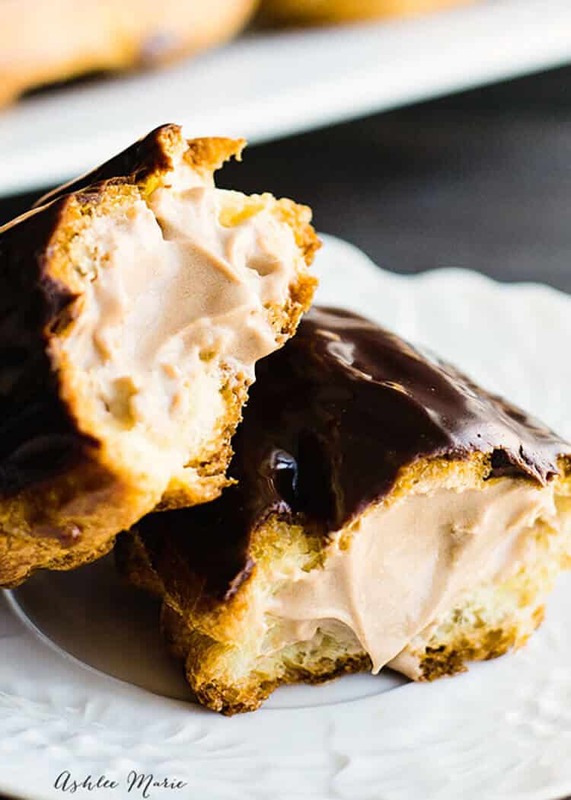 SO when you rip the eclair open you should find it filled with wonderful chocolate pastry cream. I’d fill one, to get a feel for it, rip it open to see if you got it right then fill the rest (a “throw away” you get to eat! Doesn’t get much better! How do you make maple bars? Dang, these look so good! and love the video! thank you so very much Alice! dessert is always so fun to make! Great video! These look delish! YES you do, they are so so so good!